Starting week 2 not behind, but had hoped to have painted more. Started working on finishing up my Shadows of Brimstone miniatures. They served me great at Kublacon, but now that I’m home I can finish detail, clean up slop, and wrap up the few models that weren’t quite completed before the con. Of course, that shifted quickly when I found out some pals were getting together for some low-point Horus Heresy 30k games over the weekend. I wanted to participate, so I got to work on a few models. I don’t have an extensive Word Bearers (my chosen Chapter for 30k) collection at this time, but I do have a piecemeal Red Corsairs Chaos Marine 40k army. 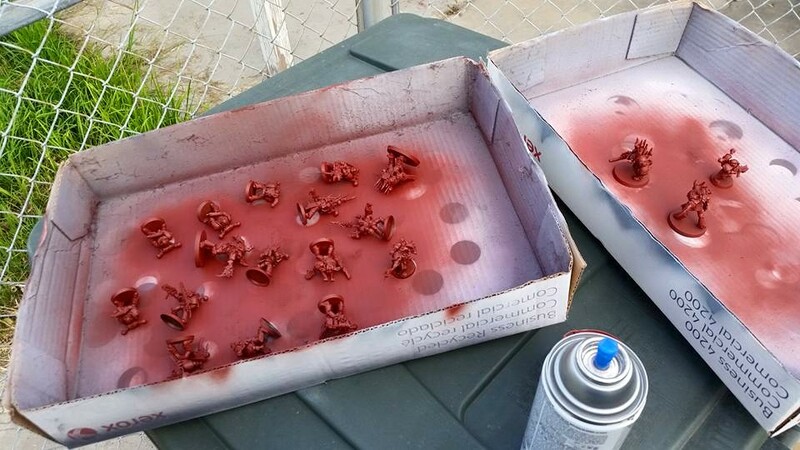 Using some of those models I went ahead and tracked down a red/rust primer from Duplicolor to use to start out painting project #2285 (the Red Corsairs). Managed to assemble just enough for the lists we were using and get them primered before the game. At least now I have some models to test my color scheme for the Red Corsairs out on. This week: work on Shadows of Brimstone models, sort and inventory my 40k Orks (Apocalypse game in August), and start assembling my Pulp City/work on Red Corsairs. We’ll see how far I get with each in next weeks’ installment.